His visions are equal parts dream and acid trip; covered with windows that warp reflections, crevices impossibly found by the sun, and surfaces textured like dew or melting cement. Antoni Gaudi’s been six feet under for nearly a century, but his works are highly recognizable, massively popular, and even as of yet, still under construction. Want to meet the man? Barcelona is the place. Fitting that a city so cosmopolitan yet sunsoaked and beachy, which stays up till 4 on Saturdays only to go to church at 8 on Sundays, would lure a man whose last name is synonymous with the nearly eponymous “gaudy”. Fitting yet not at all surprising his style came about when it did, given that around the time of Gaudi’s death the country was exporting wine, flamenco, Dali and Picasso. Standing next to one of his structures the rest of the world adjusts to gray. I’m sure I can step through the waving windows of Casa Batlló and be transported through the looking glass. When I look straight up I see noses and mouths emerging from the curving facade and am immediately reminded of the ever bickering Statler and Waldorf from The Muppets: Henson, meet Gaudi. It’s the most seductive and knotted of dreams, dripping with so much mystery that I cannot wonder why locally the building has been dubbed “House of Bones”. Park Güell sits atop a hill in the Gràcia district, overlooking the city and sea. Here I must stress one of the truths of venturing to a Gaudi design — get tickets before hopping aboard the metro. Tickets are required to enter the Monumental Zone of the park (where the mosaics, those gingerbread-y looking houses, and basically all the pictures of the park come from) and only so many people are allowed into the area at a time, leading to tickets selling out days in advance. We arrived late September shortly after opening and entry was already sold out until 4:00pm that day. The city views (which include La Sagrada Familia) in the rest of the park, and the terraces themselves are spectacular; they’re worn and faded and appear older than time, with guitarists strumming sadly underneath their stones while birds rest in the eaves above. If it weren’t for the swarming tourists I could mistake this place for Eden. Go here. Regardless of tickets, go. Just don’t go sans ticket with a heart set on entering the Monumental Zone. If I had a nickel for every smiling couple I saw taking selfies in front of the entrance, phones strategically placed to exclude the gates behind them, I’d have two dimes — not a bad earning for three minutes of observation. Gaudi’s final design prior to his death, Casa Milà, is an incongruity between material and design. The exterior is undulating stone and twisted wrought iron. If not Gaudi, then only fairies could bring to life this structure, presumably by dipping their toes into a puddle reflecting the street and teasing the distorted image into reality. Casa Milà betrays concepts like weight and gravity by transforming the impossible into the imaginable, and making the inconceivable livable. It is a residential establishment, after all. With only three days in Barcelona we ventured to Casa Batlló, Park Güell, and Casa Milà, in our first two, but even at these locations we were always outside looking in. Entering neither of the Casas nor the Monumental Zone of the Park we were determined not to miss the big show: La Sagrada Familia. Construction began in 1882, bringing us well past the 100 year mark. The city is keeping its fingers crossed that by 2026 the work will be completed, and has an annual budget of 25 million euros to keep it all going. We arrived just as witching hour began, when the sun starts setting and everything is illuminated in an amber glow. With the interior comprised almost entirely of stained glass, this was done right. One end is lit in lime and cerulean, while vermillion and scarlet stream through the other. There must be hundreds on the floor with me, everyone with their necks bent and backs twisted towards some corner or the other, but they’re all dwarfed in comparison to their surroundings and I with them. Due to Carl’s propensity to always “go up” we opt into the tower tour. 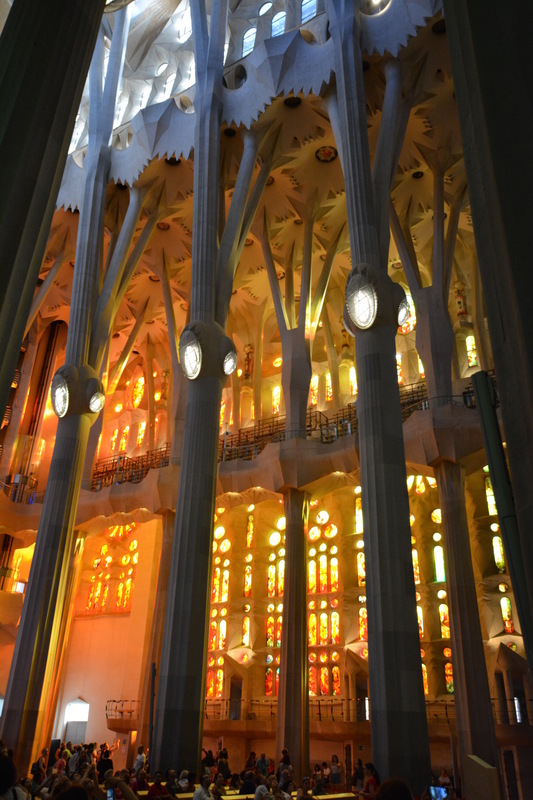 Within minutes we’re beamed up to the tippy top; Up to overlook the bordering towers, the spires which burst open with immaculately carved fruits, Barcelona below, and the sea beyond. Then, because there’s no more “up” to acheive, down we go through hundreds of feet of winding stairway. Down into the dusk where your next thoughts are of dinner, rather than “how does one man alone dream this with his eyes closed, or envision this with them open”. 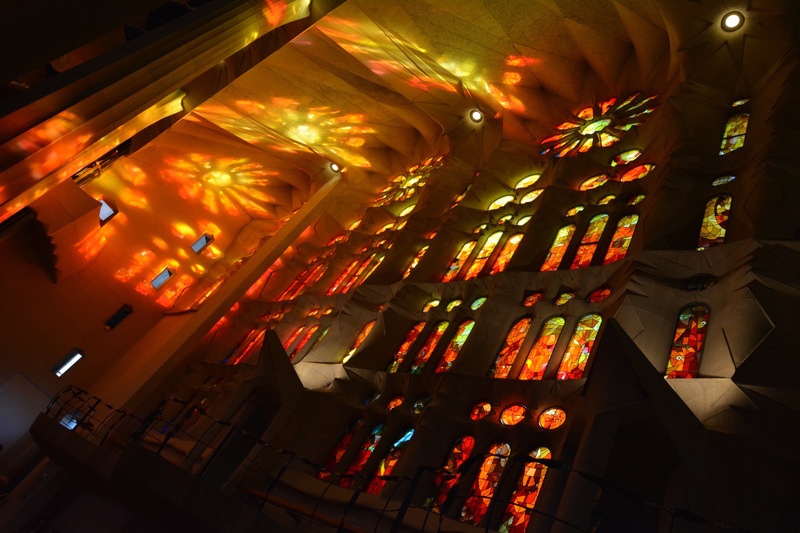 La Sagrada Familia has taken longer to construct than the pyramids of Egypt and the Great Wall of China; and when something’s now older than any man ever was, there’s not much truly new to say about it. There are some experiences that are beyond words, that warrant the creation of new languages and dictionaries to be rewritten. And because I am not a woman capable of crafting that which is unknown, only of trying to give shape to the knowable, I am not the one for this job. I cannot truly describe what it’s like to watch sunlight creep across the walls, or how much the fruits on the spires look like they’re ripened, nor how long it takes to travel from the tower back to reality — Those towers whose spires are planned to be exactly one meter shorter than Montjuïc hill, the city’s tallest point, only because Gaudi believed the work of man should never rival that of God. Maybe that’s why though I cannot articulate how the columns are carved just so, or make you believe that yes, the ceiling really does look like that, except taller and more overwhelming, I can say that it’ll cause you to grow a second soul. And for those that don’t have one already, I strongly believe it’ll either grant you one or cause you to burst into flames upon stepping onto it’s ground. Either way it’ll be a spectacle and either way it’s a dare. And if you do have one already, you can always use another. Glad you enjoyed! You won’t regret visiting La Sagrada Famillia, and if I make it back to Spain a trip inside Casa Mila is definitely on the list.